Last Christmas I made quillows for three grandchildren - Trucks and Construction Vehicles for Jesse, Dinasaurs for Beau and Baby Animals for Lola. I ran out of time to finish Taylia's but she has been very patient and I have finished it in time for her 12th birthday next week. Here are photos of the front and the back of the cushion. The front (right) shows Taylia with the Janome sewing machine that we gave her for her 10th birthday. While the machine is hers and she uses it whenever she comes to sleep-over, it lives in my studio. The back shows her on the new bike that she got for her 11th birthday from her parents. She was one very happy little Vegemite when she got that bike to replace her old one which was too small. 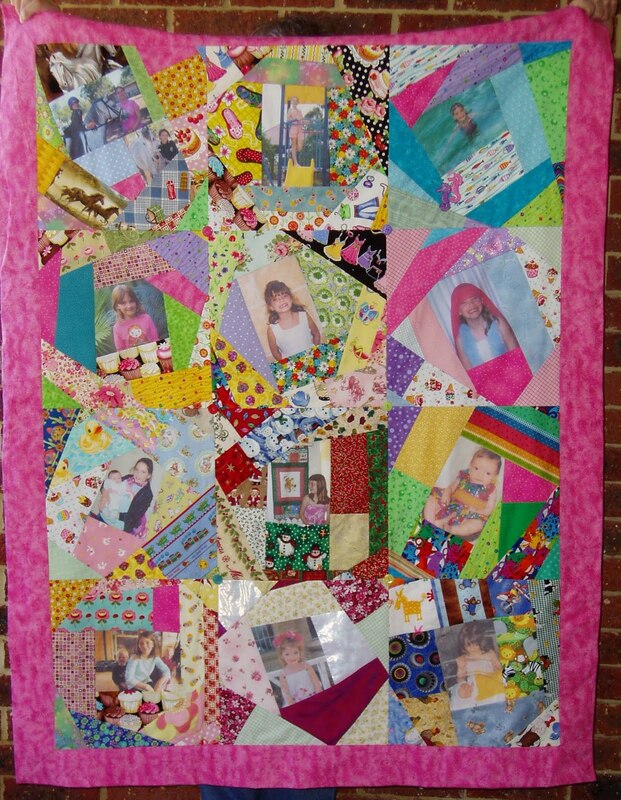 Here is the quilt itself with the twelve photos which are in no particular order, I stitched them together so that the colours blended together well and added a coloured button on each corner to anchor the front of the quilt to the back. Several of the blocks have scraps of fabric from dresses that I have made for her over the years, including a smocked romper when she was 6 months old and a flowergirl's dress when she was 3. I made sure that I included photos of two very big happenings in her life, the births of her little brother with she was 6 and her little sister when she was 10. Yes Faye, all photos of her from aged 6 months to 11 1/2 years. Some of the pieces of fabric are scraps of dresses that I have made for her over the years including the smocked romper and the flower-girls dress when she was 3.
its is just so beautiful bright and happy and I think you may have caught your GD's happy Nature completely! I know shes going to love this from her Nan, congratulations on finishing it!! What a lovely heirloom this will become, think your DH will be very pleased with it! That is Fabulous Viv. What a lovely G'Mum you are. The colours are great too.